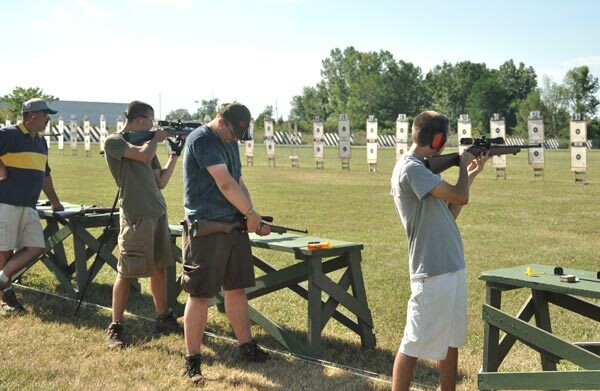 CAMP PERRY, OHIO – While some shooters dealt with a driving rain, wildly-fluctuating crosswinds and the accompanying delays, others enjoyed bright sun and calm conditions during the ninth annual Rimfire Sporter Match on Sunday, 25 July. Overcast skies and rain showers during the first relay kept spectators undercover, but winds were variable. 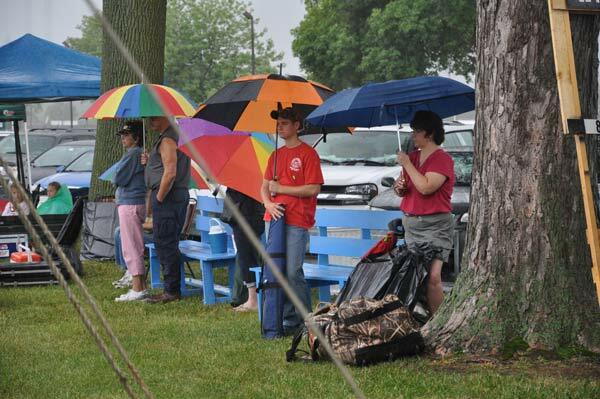 Chalk it all up to “The Camp Perry Experience.” As veteran shooters know, the weather is almost always a factor here and first-time shooters received a classic introduction to it Sunday. During Relay 2, north wind gusts mixed with driving rain began soaking targets and blowing them out of their frames. Assistant Chief Range Officer Brad Donoho, left, and Chief Range Officer, Duane Tallman directed target crews to repair targets and managed operations until winds died down. 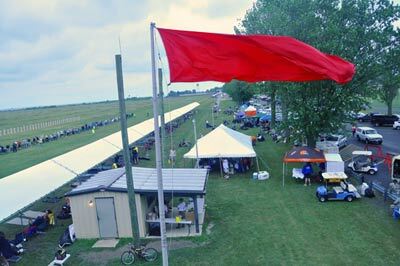 The first relay of nearly 100 shooters fired through a light rain, but the second relay was met with the pin-wheeling back side of a cold front that drove wind and rain directly off Lake Erie from the north, soaking targets and blowing many out of their frames. Once order was restored, the match continued and the third and fourth relays enjoyed clear blue skies and a light no-value breeze. Bright blue skies and sun returned to Camp Perry during Relays 3 and 4 as shooters enjoyed a gentle breeze in the afternoon. The Rimfire Sporter Match is a recreation-oriented, three-position competition using .22 caliber sporter rifles (plinking and small game rifles) commonly owned by almost all gun enthusiasts. Rifles may be manually operated or semi-automatic and competitors are broken into three classes – open sights, telescopic sights and new for 2010, tactical rifle. Shooters could enter multiple relays and fire different classes depending on space availability. 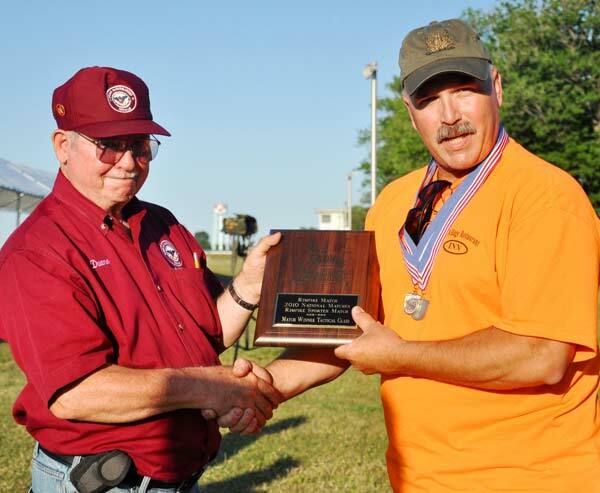 CSM Steven Slee won the Open Sights Class with an aggregate score of 578-23X. 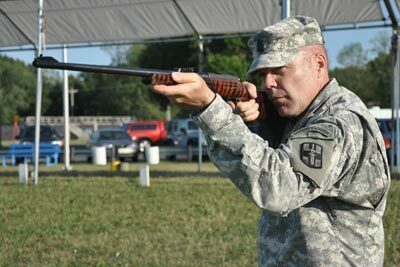 Command Sergeant Major (CSM) Steven Slee, 46, U.S. Army Reserve, of Dimondale, Michigan, won the open sights class with an aggregate score of 578-23X out of 600 possible. With a CZ Model 452, CSM Slee fired a 98-6X prone slow-fire, 98-5X prone rapid-fire, 93-1X sitting slow-fire, 92-3X sitting rapid-fire, 98-2X standing slow-fire and a near-perfect 99-6X standing rapid-fire in winning the open sights class. Charles Opalewski II was the High Junior and High 4-H Junior shooter in the Open Sights Class with an aggregate of 574-14X. Charles Opalewski II, 20, of Vicksburg, Michigan, was second in open sights with an aggregate score of 574-14X. 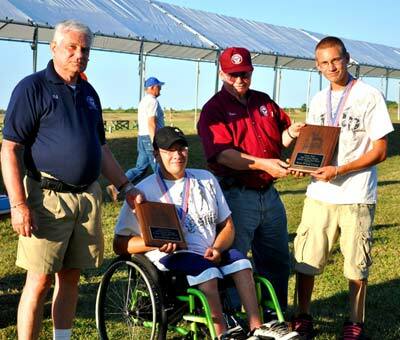 Opalewski was also the high ranking overall junior and 4-H junior shooter. Ron Villanueva, 45, of Parma Heights, Ohio, placed third in the open sights class with a total score of 573-18X. Rene Baldwin was the High Woman scorer in the Open Sights Class with a score of 528-7X. 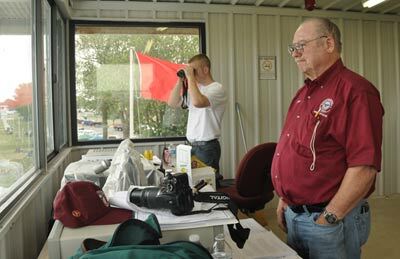 Nick Takacs, 61, of Monroeville, Ohio, was the high senior competitor in open sights class with an aggregate score of 569-17X. 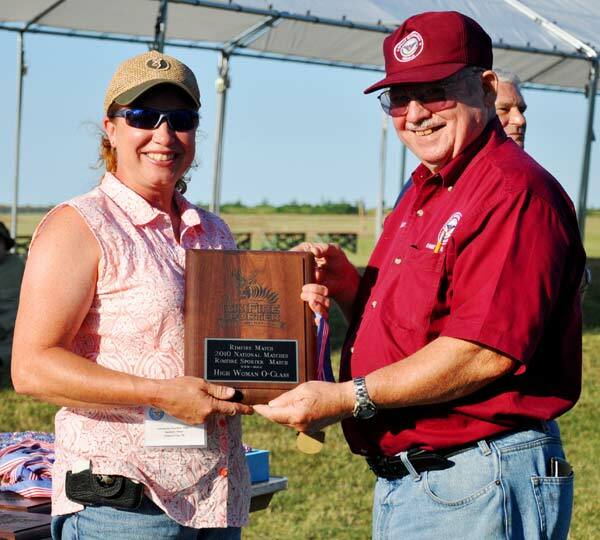 Rene Baldwin, 28, of Ellwood City, Pennsylvania, was the high woman competitor with an overall score of 528-7X in open sights. 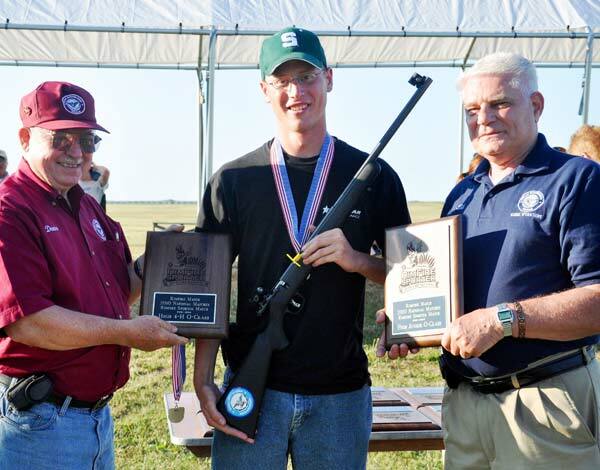 In telescopic and receiver sights class (T-class), Lucas Boord, 20, of New Stanton, Pennsylvania, used a Kimber Hunter to score 593-27X to win his class. Boord shot a 99-8X prone slow-fire, 97-4X prone rapid-fire, 99-5X sitting slow-fire, 99-4X sitting rapid-fire, a perfect 100-4X standing slow-fire and 99-2X standing rapid-fire en route to winning his class. Natalie Harper was the High Woman, High Junior and High 4-H Junior shooter in the Telescopic Sights Class with an overall score of 588-14X. Placing second in T-class was CSM Steven Slee with a 592-31X. Ron Villanueva placed third with a 589-29X aggregate score. 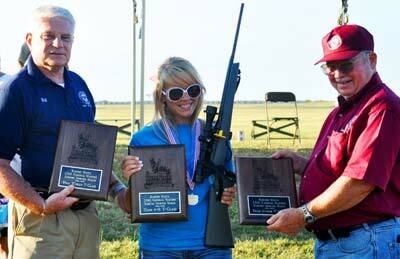 The high junior, high 4-H junior and high woman T-class shooter was Natalie Harper, 18, of Dublin, Georgia, with an aggregate score of 588-14X. The top senior shooter in T-class was Steve Gossage, 63, of Wooster, Ohio, with an aggregate of 586-32X. Gossage used his 32X center shots to win a three-way tie over Lee McKinney, 63, of Rio Rico, Arizona (586-25X) and Ernest Oelker, 63, of Youngstown, Ohio (586-21X). Mike Krites was the Tactical Rifle victor with an aggregate score of 566-18X. In the new Tactical Rifle class, Mike Krites, 53, of Cridersville, Ohio, took top honors with an aggregate score of 566-18X. He used his Smith & Wesson tactical .22 to fire 92-1X prone slow-fire, 96-3X prone rapid-fire, 90-2X sitting slow-fire, 95-4X sitting rapid-fire, 98-3X standing slow-fire and 95-5X standing rapid-fire to win his class. Placing second in tactical class was Gary Newyear, 58, of Chagrin Falls, Ohio, with a tie-breaking score of 563-13X over Denise Miller, 36, of Coshocton, Ohio, who logged a 563-9X. Miller was also the high woman shooter in tactical class. The high junior shooter in tactical class was Michael Barnard, 18, of Mentor, Ohio, with an aggregate score of 530-8X. The high senior shooter in the tactical class was Mike Krofchik, of Gambrills, Maryland, firing a 533-13X. There were no 4-H junior participants in tactical .22 rifle competition. The winning team of this year’s new Youth-Adult Partner (age 16 or younger and 17 or over) O-class competition was MAJ (Ret) Jeffrey Knop, 50, of Brighton, Michigan, and William Knop, 13, also of Brighton with a combined aggregate score of 821-11X. The team fired a 148-1X prone slow-fire, 114-2X prone rapid-fire, 142-1X sitting slow-fire, 134-0X sitting rapid-fire, 149-3X standing slow-fire and a 134-4X standing rapid-fire on their way to winning the Youth Adult Partner Match O-Class Team. Keith Stich, left, and Scott Stich were the winners of the Youth-Adult Partner Match, Telescopic Sights Class. The team of Keith Stich, 19, of Portersville, Pennsylvania, and Scott Stich, 16, also of Portersville, won the T-class match with a combined aggregate score of 1149-41X. They fired a 187-3X prone slow-fire, 196-9X prone rapid-fire, 190-4X sitting slow-fire, 194-5X sitting rapid-fire, 191-14X standing slow-fire and 191-6X standing rapid-fire in leading the T-class team field. The unopposed team of Larry Abernathy, 56, of Akron, Ohio and Aaron Abernathy, 15, also of Akron, won the Tactical class team match. Larry was the only firing member due to the malfunction of his teammate’s rifle so the team’s aggregate score was 518-20X. Gold: T-class, 577 or higher; O-class, 565 or higher; Tactical, 575 or higher. Silver: T-class, 565-576; O-class, 550-564; Tactical, 563-574. Bronze: T-class, 543-564; O-class, 522-549; Tactical 542-562. For complete results of the 2010 Rimfire Sporter Match, log onto http://clubs.odcmp.com/cgi-bin/report_matchResult.cgi?matchID=5689. View photos of the Rimfire Match at http://cmp1.zenfolio.com/p42160567.